A while back, Virgil Flowers was just a supporting character in John Sandford’s long-running Prey series. He’d help Lucas Davenport out on an investigation, then fade into the background again until Sandford revived him for another cameo appearance. But here we are now, with Escape Clause, the ninth book in the Flowers series, and perhaps the best, thanks to its fresh take on a traditional plotline. This time around, Virgil is hunting a group of thieves, who have stolen rather precious loot from the Minnesota Zoo: two Amur tigers, whose bodies could be mined for various remedies. Question is, can Flowers apprehend the thieves before the tigers are killed? Whenever I think about my favourite crime writers, I always overlook Sanford, which is a serious injustice on my part. Sandford’s novels aren’t ground-breaking, but they are exemplary, exceptionally well-constructed, and highly polished police procedurals / thrillers. He writes the kinds of books you’ll bomb through in no time, and enjoy every second. So, what makes his novels – Escape Clause, in particular – so compulsive, then? Beyond his stark style and ability to craft brutally violent, adrenaline-pumping action scenes, it’s Sandford’s villains that truly stand out, never more evident than that of Winston Peck VI, an M.D. barred from practicing after it was discovered he was groping unconscious patients. Make no mistake: Peck is a bad dude, but he’s not a killer. At least, he never planned to be, but as the authorities close in on him, he does what he feels he must in order to survive. If that means ending a few lives, well, so be it. But that doesn’t mean he has to like it. He’s not a psychopath. Or is he…? Some of the novel’s best moments see Peck debating his mental state, adding layers to what could’ve been a very rote villain. Lots of crime writers nail their protagonist and the puzzle that needs solving; few are as capable of conjuring such enigmatic bad guys. Exciting, absorbing and intriguing, Escape Clause is the perfect crime thriller for this time of the year, as the weather begins to warm up, and readers are looking to wile away a few hours at the beach with an enthralling book. It’s not all flawless; there’s a secondary plot thread involving Virgil’s girlfriend’s sister, which feels very much tacked on, and a tad unnecessary – but it doesn’t overshadow the effectiveness of the ‘A’ plot. If you’ve never read Sandford before, don’t feel put off by the fact this is the ninth entry in a series. Escape Clause is a fine place to start, and I bet it’ll have you scouring your local bookstore for Virgil Flowers’s earlier capers. Then, don’t forget, you’ve got the Lucas Davenport books to savour. Man, those of you who are new to John Sandford are in for such a treat. With Extreme Prey its twenty-sixth instalment, you’d think John Sandford’s long-running Lucas Davenport series would’ve reached its crescendo long ago, and by now, be drifting into paint-by-numbers territory. But somehow, Sandford remains a mystery connoisseur’s delight, and remains the go-to guy for relentless page-turners that can be read without once having to invest in a bookmark or – dare I say it – bending the corner of a page. Following the events of Gathering Prey, Davenport is out of a job and killing time. When his friend, the governor, who is ramping up a presidential campaign, invites Lucas to join his campaign staff, Davenport agrees, if only to fill the vacant hours of his days. But when the governor reveals concern about a potential threat to his rival nominee, Lucas’s investigative skills are called into action to ensure such an assassination plot is never enacted. It doesn’t take Lucas long to verify the threat; but stopping it from happening is another matter entirely. With the US election in full swing, Extreme Prey is topical, but barely dips its toes into politics. While the novel focuses on extreme politics, Sandford wisely omits any long-winded political monologues, maintaining the peerless tautness his mysteries have earned such esteem for by focusing on the investigation and the ensuing violence. Davenport ruffles many feathers as he seeks vindication of the threat, leading to the unveiling of many red-herrings, and more than a few tangential murders, which muddy the waters, and leave Davenport racing desperately against the clock. Sandford’s handling of the labyrinth plot is masterly, and while characterisation is forsaken in exchange for raw pace and action, his fast and furious approach is sure to keep eyes glued to the page. Extreme Prey is twisty and topical, and a treat for readers; Davenport veterans, and newcomers, too. Thanks to Penguin Group Putnam and NetGalley for a review copy of the book. In his 25th appearance, Lucas Davenport of Minnesota’s Bureau of Criminal Apprehension crosses state and jurisdictional lines as he hunts a gang of vicious killers – more akin to a demonic cult, and prone to torturing their victims – led by an enigmatic figurehead, ‘Pilate.’ Not only is Lucas’s life – and job – on the line; his daughter, Letty, knew one of the victims, and her stubbornness – inherited from her father – puts her in Pilate’s sights. 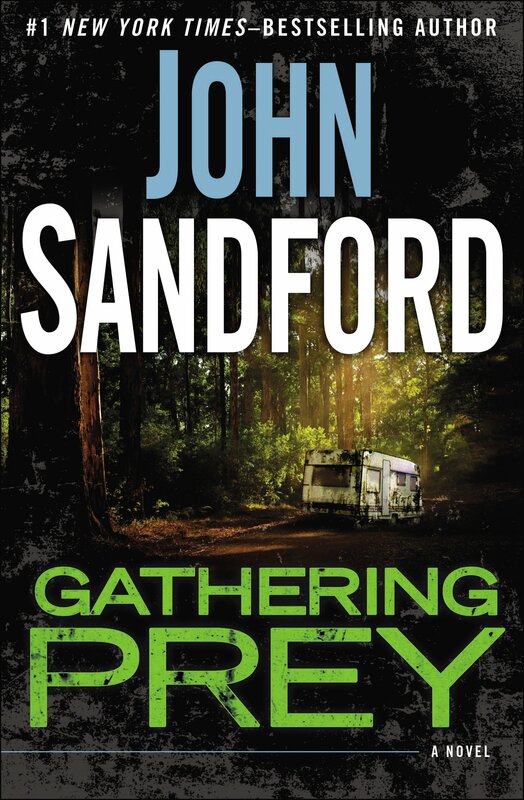 GATHERING PREY exudes the well-oiled plot mechanics, bursts of violence, and sizzling dialogue that have established Sandford as one of the genre’s best. His latest thriller sets its rip-roaring pace from its opening pages, when Letty Davenport buys a meal for a pair of buskers, Henry and Skye, and learns about Pilate – a drug dealer and killer, who has amassed a mob of followers who share his predilection for murder. They’ve claimed ten victims so far; an eleventh is added to that tally when Henry is crucified and castrated, and left for dead. Months after their first meeting, Skye reaches out to Letty, who can’t confirm Henry’s fate, but fears the worst. And while Letty a wholly capable and independent young woman, her doggedness can’t match her father’s decades of experience in law enforcement – and his reach. Once again, Lucas Davenport is on the case; and this time, following Letty’s encounter with the sadistic Pilate, it’s personal. Davenport’s investigation takes him to a variety of locales, and leads to alliances with a variety of faceless sheriffs, deputies and investigators which is the novel’s underlying problem; both its heroes and villains, save for Lucas and Letty (who benefit from extensive continuity) are innocuous – just names on the page, spared of any depth. In keeping GATHERING PREY lean and mean, Sandford has perhaps excavated a tad too much characterization; so when the stakes rise and lives are on the line, we’re not too bothered – we don’t really know these people. Pilate too, merciless as he is, feels more like a facsimile of every other murderous foe readers have encountered. There is little to separate him from the villains we’ve encountered before, which is disappointing. GATHERING PREY moves at a fast clip, and is undeniably entertaining, though ultimately forgettable. Long-time Sandford fans will lap up the latest ‘Prey’ novel, and are sure to enjoy their hours spent with Lucas, who is as much a stalwart of contemporary crime as Harry Bosch. New readers mightn’t be ensnared by this one; but that shouldn’t discourage them from checking out Sandford’s vast backlist.